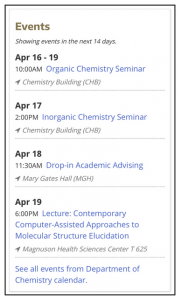 MyUW mobile now integrates with UW Event Calendars to support students. 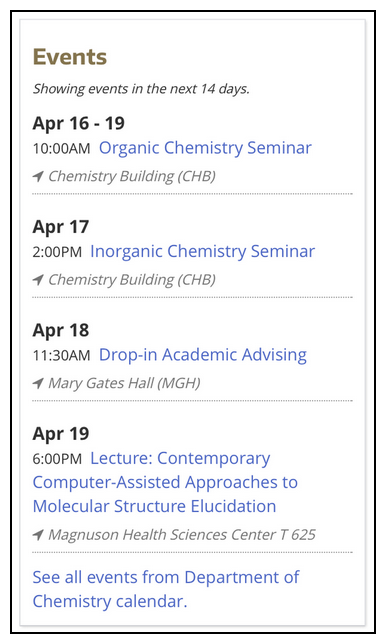 MyUW’s Relevant Events feature pulls event data from departmental calendars that run on Trumba software and shows events to students based on their declared major (see image at right). Students with identified majors can see events that are relevant to their course of study. So, for example, a music major can see events published on the Music Department’s Event Calendar. In previous surveys and research studies conducted at the UW, students said they want to see events that are pertinent to their interests. Relevant Events makes it easy for departments to reach students, letting them know about events that can enhance their studies. Integrating MyUW and UW Event Calendars meets an additional goal: reducing the number of places students must check to get the information they need. For the initial release of Relevant Events, about 65% of majors were mapped to a departmental calendar. MyUW checks for new events every time a student logs in to MyUW. Any events scheduled to occur in the next 14 days will appear. If no events are posted on the departmental calendar, no events will be visible in MyUW. Only students with declared majors will see relevant events; students with double majors will see events relevant to both majors; students with a major and a minor can see the relevant calendars; graduate students will see events relevant to their course of study. Some programs, such as an interdisciplinary program like Applied & Computational Math Sciences, include majors in math, computer science, engineering, biology, etc. Students with interdisciplinary majors may see four or five calendars that map to their major. Only events that are posted to calendars running on Trumba software will appear on MyUW. UW-IT encourages departments that do not currently have a department calendar or do not use Trumba for their calendars to consider making the switch.